Resource cast iron brake pads do not meet the requirements of operatives in connection with the non-uniformity of the microstructure of cast iron. This is confirmed by the results of the survey block that comes on the Far Eastern Railway. Modifying the iron ligatures zirconium improves life by 30% due to the alignment phase distribution and grinding grain. Key words:Mineral raw materials, brake shoes, cast iron, composition, structure, properties annotationg, modeling compositions, heat-resistance, structure formation, single-crystal blades. The paper has been devoted to researches of refining of high alloyed cast iron out of furnace. It has been showed that hot metal is satiated by combinations of its components with oxygen, nitrogen, hydrogen and sulfur during casting of rolling tool. The refining of metal by introduction of special reagents and compulsory interfusion of the liquid metal with nitrogen in the ladle has been proposed. It has been established that such treatment reduces the sulfur content in the composition of complex alloy in 2 times and its contamination with non-metallic inclusions by 45% compared to unrefined metal. Key words:Chrome-nickel cast iron, non-metallic inclusions, refining out of furnace, roll, sulfur chemical component, core, level of properties and stresses, roll. Capabilities of ultrasonic check of structure and strength characteristics of iron castings with different walls are discussed. Dependencies of ultrasound velocity on graphite shape and iron strength in a casting have been revealed. Examples of modern equipment and organization of successful ultrasonic check of metal structure and strength in iron castings are given. Key words:Flaky graphite iron, vermicular graphite iron, spheroidal graphite iron, castings, microstructure, mechanical properties, ultrasonic check, research equipment. A system of modular design-and-technology preparation of manufacturing iron pistons for internal combustion engines is proposed. It is recommended to do design, technological and organizational work at the same time. Stressedly-deformed state of monolithic 120-mm pistons from vermicular graphite iron has been simulated. Key words:Modular system, internal combustion engine piston, vermicular graphite, stressedlydeformed state, aluminum vermicular graphite iron. There are defined integrated approaches to creation of heat-resistant alloys of new generation, providing of high characteristics which are components of technology of their production and processing. There is defined as fundamental postulate for developing heat-resistant alloys of new generation the principle of continuity material – technology – equipment – construction, including implementation of complete life cycle (with use of IT technologies) – from material creation before its operation in a product, including diagnostics, repair, overhaul-period renewal and utilization. The basic principles are formulated and integrated approaches to creation of modeling compositions of new generation on the basis of synthetic resins and waxes are defined. Key wor:Heat-resistant alloys, investment pattern casting, modeling compositions, heat-resistance, structure formation, single-crystal blades. Investigated were some process features of making ceramic molds for investment casting of aircraft parts, starting from peculiarities of preparing wax pattern surfaces before slurry application to studying bench life and dispersion composition of fillers in slurries based on water-colloidal binders. The investigations were carried out for six types of fillers, four binder grades and 13 slurry compositions. A comparative evaluation of some properties of aqueous ceramic slurries and those based on ethyl silicates was carried out. Key words:Ceramic slurry, water-based slurry, water-colloidal binder, zeta-potential, slurry life, bench life, wax pattern, wetting angle, filler. 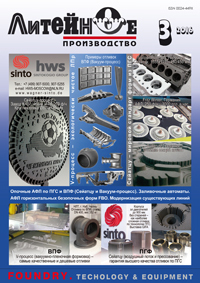 The paper presents a method of producing bimetallic stamping for cast-solid forging alloys based on copper using a water- and gas-tight molds which are made from the moldable mixture, consisting of zircon concentrate, metallic shot, phenol-formaldehyde resins catalysts, backhouse dust. The backhouse dust is produced from waste gas streams in special centrifugal units are called backhouse electric arc steel and cast iron. Gastight shapes that are at the bottom of the form allow directional solidification casting of bimetallic upwards by applying a water-air coolant. Key words:Bimetallic stamp backhousеdust, mold, directional solidification, the metal fraction of mono-alloyed austenite-biotitic cast iron, ferrite-carbide steel, molding sand, zircon concentrate. Development of technology for casting ice pattern aims to produce environmentally friendly production. Developed methods for forming consist in the fact that the melt is filtered fluid pattern in the mold of loose sand mixture, molding the shell. The proposed options for the manufacture of shells on the sand ice pattern shows significant opportunities cryotechnology combination with traditional molding. Key words:Sand casting, investment casting, ice, ice pattern, cryotechnology, molding, shell mold, filtration. Development of technology for casting ice pattern aims to produce environmentally friendly production. Developed methods for forming consist in the fact that the melt is filtered fluid pattern in the mold of loose sand mixture, molding the shell. The proposed options for the manufacture of shells on the sand ice pattern shows significant opportunities cryotechnology combination with traditional molding. Key words:Sand casting, investment casting, ice, ice pattern, cryotechnology, molding, shell mold, filtration. A scheme of a pilot unit for binder deposition onto sand grains with a gas distribution sand grid is shown. The influence of grid porosity on the strength of sand obtained is investigated. Its optimum value is found. The advantage of the unit proposed is shown. Key words:Pilot unit, deposition, coating, uniformity, strength, porosity.